♥ Here is the Sock Monkey Bathroom series. There are 5 of them, besides the Bath Tub ones and these are perfect for reminding the kids of the things they need to do before running off after using the bathroom. These prints would be a great addition to your sock monkey collection or bathroom décor. 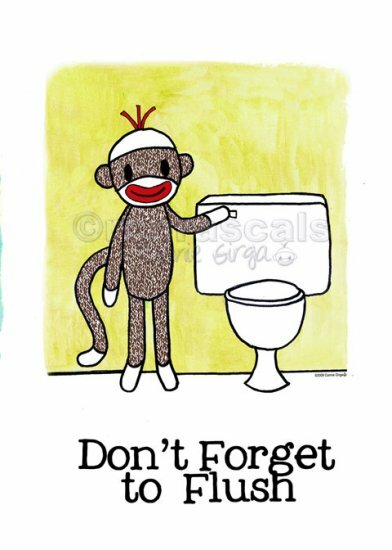 ♥ This listing is for the "Don't Forget to Flush" print. ♥ PLEASE NOTE: This listing is for ONLY ONE of the five. If you’d like to buy all 5 or the 18”x6” panel of 5, please see my other listings. ♥ These prints are of my original artwork/images, which were hand sketched with pencil, ink, and painted with watercolors, then enhanced digitally. It is printed onto rich lustre paper. The image itself is approximately 3” x 5” leaving a white border making it perfect for framing by itself, but also looks wonderful with a mat. These prints also come in a 5”x7” ($12) size, 4" x 6" ($8), as well as a panel of all 5 in an 18” x 6” size ($45). Please email me if there is not a listing for a particular size and print that you’d like. ♥ The large ©rcnrascals/monkeyhut copyright watermark across the middle will not appear on the print you will receive. Copyright: ©All artwork, products, and images are ©2000-2009 Connie Girga (aka rcnrascals and Monkey Hut). Artist retains copyright and artwork images are not to be reproduced in any way. All rights reserved. ♥ Thanks so much for peeking and have a wonderful day!